When a small country like the Netherlands runs the Wiki loves Monuments competition for three years in a row, you would think everything has been photographed. You would think that every monument has been described. Because of the great cooperation with the governmenmental organisation for Cultural Heritage (RCE), it has been quite clear how many monuments there are; from the start there were lists compiled from its databases. Obviously the RCE has its own photos of most of the monuments; they are used to do whatever is needed to maintain the necessary information. The RCE has been taking pictures for many years. Currently there are some 555.000 images in its collection. All of them are now available under the Creative Commons Attribution-Share Alike 3.0 NL license. All of them will be uploaded to Commons. With all these images available on Commons, this collection is available to people from all over the world who want to learn about the Dutch cultural heritage and its monuments. As this is a cooperation with the RCE, it comes with references to the RCE database where much more information can be found. Add to the over half a million pictures from the RCE the pictures of Wiki loves Monuments and there is an obvious challenge; how to find the pictures of the same object. 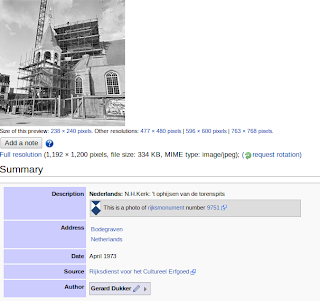 The good news is that the RCE numbers were available on the list.. A Commons picture of the tower in Bodegraven standing tall can be found here. Combining all the related information is relatively easy to do in a database.. Maybe, one day Wikidata will be the platform making all these connections for us. 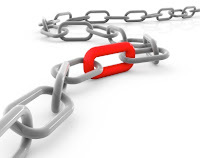 The RCE has given us a great gift, it is for us to use it and make it available in a usable way.